Disney's tropical fairy tale "Moana" is dazzlingly good looking, but the movie's tediously formulaic empowered-princess plot feels as if it was left out in the sun too long, its songs (co-written by "Hamilton" creator Lin-Manuel Miranda) are aggressively annoying and the entire project feels pandering and phony. 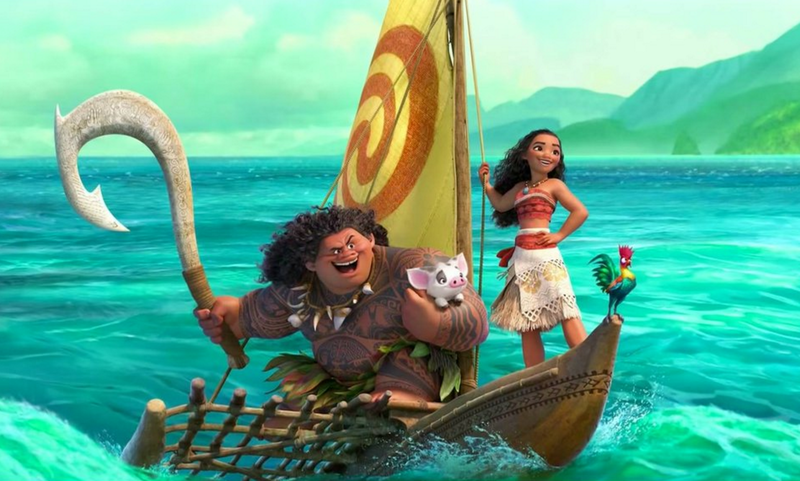 The girl-power basics that worked so swimmingly in many of the studio's past efforts (most notably "The Little Mermaid") feel so by-the-numbers and once-more-back-to-the-well here that "Moana" sinks like a stone. The title character, voiced with generic Disney Channel overenthusiasm by Auli'i Cravalho, is the daughter of a chief and is being groomed to succeed him. She's frustrated that he won't let her sail beyond their island's reef to explore. Supernaturally selected by the ocean to find the exiled demi-god Maui (Dwayne Johnson), she also must convince him to save the world by returning a magic rock to the island where he stole it. So off she goes with a crazy chicken stowaway, shout-singing a typical anthems-by-the-yard ode to optimistic self-realization. The screenplay is credited to Jared Bush, with no less than seven story-by credits, but there's probably Disney scriptwriting software that could have done an equally minimum-basic-requirements job. Things that don't make much sense include the fact that the ocean-as-character could take care of the entire put-the-rock-back mission with no assistance from Moana or Maui whatsoever. Also, it's ridiculously unlikely that Our Heroes could emerge unblowdarted after an encounter with hundreds of seafaring coconut pirates (as in "pirates who actually are coconuts"). A character's death is rendered moot when she reappears more than once in physical form to freely communicate with the living. The massively muscled Maui's egomaniacal childishness is one-note tiresome, except for the requisite moment when he must solemnly relate his unfortunate origin. The single strangest story misstep occurs when Moana giddily recalls the flavor of "that's some pork" aloud in a hut. Hearing this, her adorably cute piglet pet understandably shrinks back in shocked disappointment. Although Moana immediately regrets being overheard, there's no indication from her that the shocked pig won't end up on a plate later. Oink! Despite all of those drawbacks, there's no disputing that the computer-animated film is incredibly beautiful. The manic high-seas showdown with those coconut pirates, a couple of confrontations with a living lava demon and a journey to an undersea land of monsters are wonders to behold. By far the standout scene visually is a confrontation with a colossal and very crabby crab (voiced by Jemaine Clement of Flight of the Concords), who shifts from gold-plated to colorfully black-light radiant. His decidedly non-Sebastian-like rap number wasn't my cup of poi, but he sure looks good performing it. Maybe the current miserable state of the real world is partly to blame, but something about this movie's bludgeoningly inspiring attitude, far too frequent high-fives, saccharine air of self-satisfaction and simplistic celebration of wide-eyed can-do confidence made me want to leave midway through and go read a book in the lobby. There's only so much artificial paradise a guy can take.